This is just a quick post about some problems I had with video calling on Skype recently. If you aren‘t sure how to make a video call on the new Skype (version 6) please read the walk through on the Skype website here. So my problem was that, although I had previously tested my built-in Macbook camera was working (but not running in the background) and I could even see myself under the Audio/Video tab in Skype Preferences, every time I pressed the video call button it tried its best to switch to video and then reverted back to voice call. I really didn‘t understand what was going wrong. As usual I turned to the internet for help, but in the end I managed to solve it myself with a few pointers to the reasons causing the problems. If you are talking to someone who is using a previous version of Skype earlier than version 4.2, and you have a later version, video calling will not work (as far as I can tell). Skype has forced most people to upgrade to the latest version so this is not a problem for most people, however, if you are running the latest version (which is currently 6.4.59.833) you may have problems with anyone using a version earlier than 5.0. OK, so the solution is simple – downgrade. 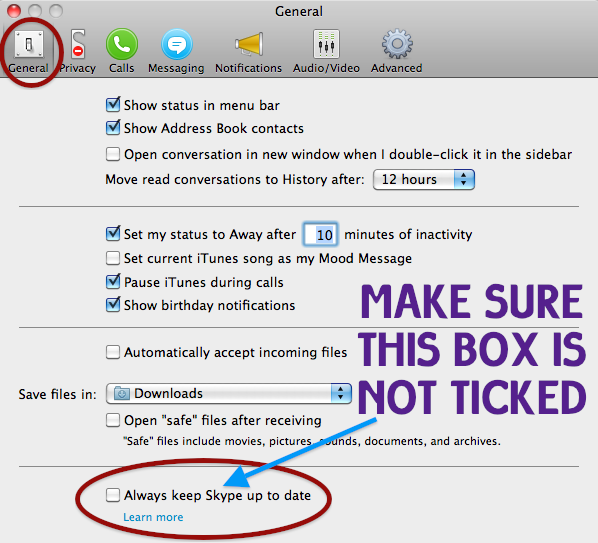 And then make sure you tweak your Skype to stop it upgrading automatically. 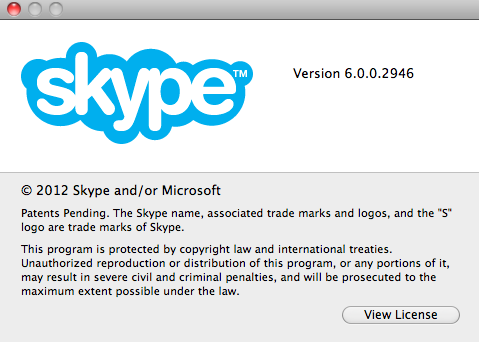 Download version 6.0.0.2946 of Skype. You can download it here. Install Skype 6.0.0.2946 which you just downloaded. You can do this by double clicking on the .dmg and then dragging the Skype icon into your Applications folder. Open Skype and Sign in. At this point or quite soon after you will be faced with this message. Always choose Skip Update. If you choose Install on Quit you will just be back to square one. 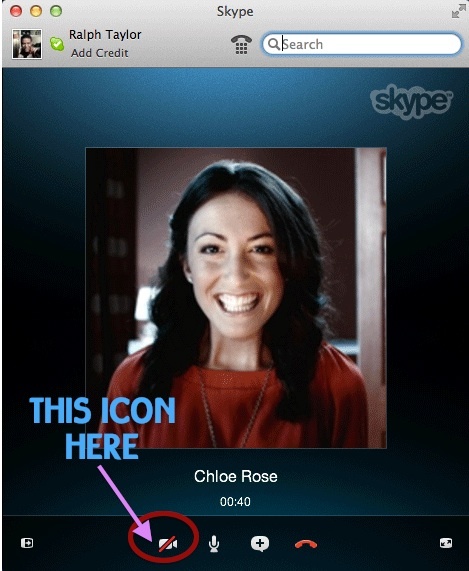 Go in to your Skype Preferences and under the General tab make sure Always keep Skype up to date is NOT ticked. Now when you make a call regardless of the version your contact is using you should be able to video chat. Hurrah!